LONDON - Now that 'Jedward' - 18-year-old Irish twins John and Edward Grimes - have been voted off The X Factor and are no longer subject to the programme's contractual restrictions, the duo have reportedly received several requests from brands hoping to tap into the media frenzy surrounding them. 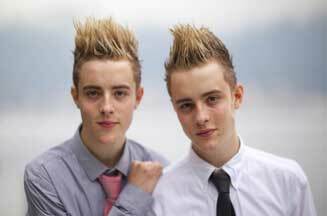 Keeping the Jedward brand alive will be a challenge, but a rushed brand partnership would do none of the parties involved any favours. When singer Susan Boyle was approached by brands after her stint on Britain's Got Talent, she wisely stalled and instead took herself and her brand to the US to work on an album, which went on to reach number one in Amazon's preorder charts months before this week's release. Unfortunately, Jedward do not share Boyle's gift for singing - they progressed on The X Factor because they were ‘entertainers'. With The X Factor live tour on the horizon, the boys have some time to consider their options, but their X Factor mentor, Irish boy-band mogul Louis Walsh, will doubtless have a hand in the Jedward brand development plan, too. The closest thing to a precedent, however, seems to be the Cheeky Girls. After auditioning for Popstars: The Rivals, the Romanian twins' first single - The Cheeky Song (Touch My Bum) - was voted the worst pop song of all time in a Channel 4 poll in 2004. They almost went bankrupt in 2006 after various spats with their record label. One of the twins, Gabriela, got engaged to Liberal Democrat MP Lembit Opik, and in September the girls launched a cosmetics range aimed at young teens.